A delicious pizza I made for my brother and his friends during a football weekend. I also wanted to use a new baking stone. Using a cookie sheet is how I've made pizza before. A pizza stone is new to me. Ingredients and direction adapted from copykatchat.com. I thought it turned out well for the first time making. Prepare pizza dough according to instructions or follow your favorite homemade recipe. Pre-cook the sliced potatoes with spices in a large covered skillet with 2 cups of water. Cook on medium-high heat until potatoes are tender. Remove lid and simmer until liquid is no longer present. Add about 1 teaspoon of cooking oil; toss potatoes so they don’t stick to skillet. Watch carefully, as the potatoes can burn easily. Place cooked potatoes into a bowl and set aside. In a bowl, mix sour cream and diced jalapeno together. This is an optional step since the cayenne pepper should give this pizza recipe the spiciness already. The diced jalapeno gives it a little bit more kick. Assemble the pizza for baking. First, spread 3 tablespoons of sour cream onto the pizza crust. Cover with sliced spicy potatoes. Spread the last 3 tablespoons of sour cream on top of potatoes. Spread grated cheddar and mozzarella cheese evenly. Do the same with crumbled bacon bits. Bake in a preheated 400 degree oven for 20 to 25 minutes. Before cutting, allow the pizza to sit for about 5 to ten minutes. 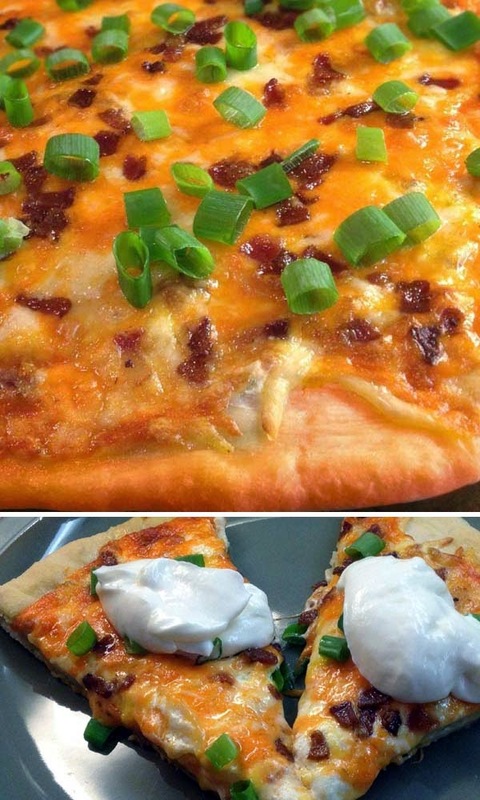 Serve each slice of pizza with a dollop of sour cream and some green onions. Lately, I've beeng using gluten-free doughs. Taste different, but you get used to it. Also, don't make the same mistake that I made by first assembling the pizza on a baking stone, then having to carefully remove the pizza and setting it aside while preheating the baking stone properly. That took another half hour or so. I'll know better next time. Making this pizza seems like it's a lot of work than, say, something made with a slow cooker. But it's worth it. This very quick tutorial on how to cook a pizza using a baking stone in an oven should help you understand more about the process. Notice how the pizza was prepped apart from the baking stone. Doing so lets you pre-heat the stone inside the oven while the pizza is being assembled.